Mapping address data in Drupal can be confusing, if only because of the great number of contributed modules available that involve online maps. Picking the right module (or combination of modules) is challenging - especially for site builders who are new to mapping in Drupal. In this tutorial, we'll utilize the popular and well-supported Geofield module as one of the key ingredients in the common task of entering address data and having it displayed on an interactive map. This tutorial contains step-by-step instructions for accomplishing this task, as well as a screencast demonstrating all of the steps. We'll use the example of adding DrupalCamp address information to a Drupal 7 site. The site will then automatically display the DrupalCamp on a map on each camp's page, as well as display all camps on a single map. Finally, we're going to look at some of the options for using different map base layers. This tutorial assumes that you're familiar with Drupal's "big 5" (content types, taxonomy, menus, users/roles/permissions, and blocks/regions/themes), the Views module, as well as downloading, installing, and enabling modules. Create a new DrupalCamp content type with a standard (postal) address field. 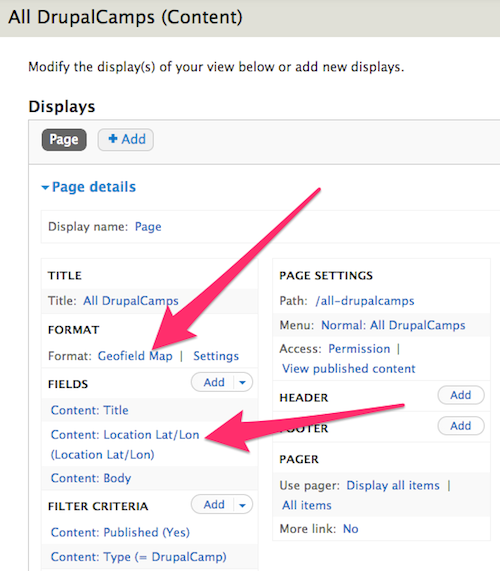 Add a (Geofield) field to the DrupalCamp content type to store each address's corresponding latitude and longitude. The Geocoder module will be used to convert the postal address into latitude and longitude values. Configure the DrupalCamp content type so that a the latitude and longitude field are displayed as a map. 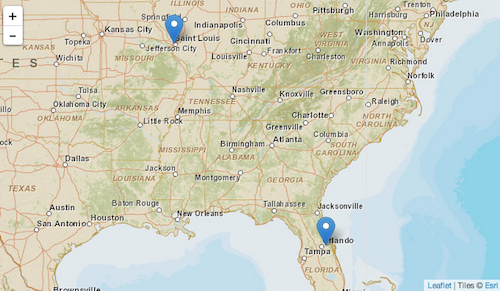 Create a view that displays all DrupalCamp nodes' address information on a single map. Check out the various options for changing the look of the maps. 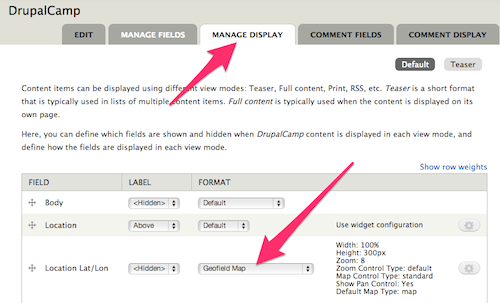 The Geofield module is used to store geographic data in Drupal 7. It can store points, lines, and polygons, but for this example, we'll just be storing individual points (locations) - luckily, this is the easiest (and most common) scenario. The Geofield module also requires the Chaos tools module as well as the geoPHP module. The Geofield module also comes with the Geofield Map module, which we'll be using later in this tutorial. Before we go ahead and add a new Geofield field type field to our DrupalCamp content type, we're going to want to go ahead and also enable the Geocoder module. This is because the Geocoder module provides a widget for the Geofield field type that we're going to use. The Geocoder module also requires the Chaos tools and geoPHP modules. Limit of 2,500 requests per 24 hour period - additional requests are available at various price points. Note: you'll need to have an active internet connection for the Geocoding to work. Feel free to add other fields to the DrupalCamp content type at your lesiure, but for this tutorial, this is all that we're going to need. At this point, we're ready to add some DrupalCamp nodes. Find some DrupalCamps to enter - be sure to enter complete location information for each. Well Known Text (WKT) is a text markup language for representing vector geometry objects on a map, spatial reference systems of spatial objects and transformations between spatial reference systems. Now, go back and take a look at one of your DrupalCamp nodes; instead of the Well Known Text data, you should see a Google Map with a pin at the location of the DrupalCamp. Note that this is a fully-enabled Google Map that you can pan, zoom, and do most anything else you do with any other Google Map. Note: you'll need to have an active internet connection for the map to display. The ability to view numerous DrupalCamps on a single map is the next logical step. The Views module provides the ability to display lists of content. In this case, our content is DrupalCamp, and instead of a traditional "list", we're going to output our view as a map. In the "Content: Location lat/lon" settings, click to "Exclude it from display" and leave other settings at their default values. The "Data Source" setting tells the Geofield Map formatter where to look for the latitude and longitude data. In this case, the Geofield-based "Location lat/lon" field that we included in our list of fields for this view. The "Popup Text" setting instructs Geofield Map to use the title field as the text to display when the camp's pin is clicked. Navigate to the "all-drupalcamps" page on your site and you should see a Google Map with a pin displayed for each DrupalCamp node on your site. While the Geofield Map module outputs only Google Maps, the Leaflet module provides a number of alternative "base layers" that can give your map various looks. While the Leaflet module does a lot more than just provide alternate base layers, we'll only be looking at this functionality in this tutorial. The Leaflet module requires the Libraries module, the Entity API module, as well as the 3rd-party Leaflet JS library. Be sure to read the installation instructions to make sure everything is installed properly. The Leaflet module comes with several modules. For this tutorial, we'll need to enable the "Leaflet", "Leaflet More Maps", and "Leaflet views". modules. The "Map" setting provides numerous different options for various base layers for your map. Depending on the type of content and/or the style of the site, one base layer may be more appropriate than another. There are a good number of other options in the "Leaflet Map" settings, including the ability to use custom "points" (or "pins") and vector display options (for when the map is displaying more than just points). There's also a "Descriptive Content" field that can be used to display additional content about the DrupalCamp when the pin is clicked. This is commonly populated with a trimmed version of the body field of the node. Over the years, there have been lots of ways for displaying interactive maps on a Drupal site. Each iteration provides more features and easier setup and configuration. What this tutorial covered is just scratching the surface of what can be done. There are numerous Geofield- and Leaflet-related modules that extend the functionality of the basics presented here, be sure to check them out! Checking in With Drupal Mapping (October 19, 2013) - presentation by Brandon Morrison from DrupalCamp Atlanta. Interactive maps with Leaflet and more (April 13, 2013) - presentation by Josef Dabernig from Drupal Camp Alpe-Adria. Interested in inputting geographic information via a map (instead of geocoding or typing in latitudes and longitudes)? The OpenLayers module provides an input widget for Geofield. Great intro to maps! 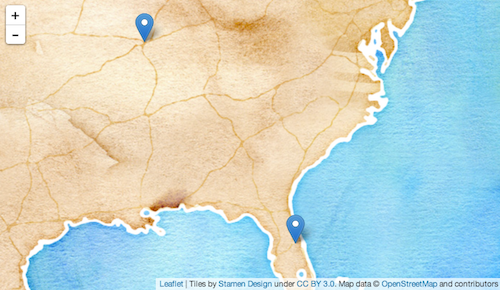 Getting started with maps in Drupal can be daunting as there are so many! The set of modules you picked (Geofield, Geocoder, Addressfield, Views, Leaflet, Leaflet More Maps) is probably my favourite starter pack. Here's the great thing: you can get all of the above by adding to the set-up described one more module: IPGV&M, http://drupal.org/project/ip_geoloc. No need to redo or start from scratch. Keep what you've got, then enable IPGV&M and select the above options from its configuration pages. Finally, to really top of what is by then already a seriously good mapping station, install Leaflet MarkerCluster . Mapping is a OMG most of the times, so this screencast really comes along as nothing but a savior. Very straightforward, concise, and yet thorough enough to actually get down to the dirty parts of implementation. Many thanks to you Mike, for the time you've put into this, and for getting it out to all of us to use and learn from. Thank you for the article; good information. Would be strengthened with the inclusion of a (even brief) comparison to other approaches, pros/cons of each, and reason for choosing this one. Thinking in particular of location module, which has 50,000 installs against geofield's 20,000, yet is omitted from the discussion. I didn't mention the Location module because I believe that the vast majority of those 47,000+ installs are on Drupal 6 (and earlier) site as well as Drupal 7 sites that were migrated from Drupal 6 (and earlier). I can't think of a single use case where I would recommend new sites using Location module over GeoField and the other modules I discuss above. They represent a much more modern, flexible, and sustainable method for mapping in Drupal. Great article, will you be offering a similar tutorial for Drupal 8?